Recently, windows XP Pro x64 and Windows 7 x64 installation started to act strange for one friend. So, I got involved and after a quick view, the issue was generated by a huge number of handles. Explaining this issue may help others to solve an ugly situation. Basically from some point trying to open any application in windows was generating an error. Memory didn’t show up as fully used, but the machine was going slow. 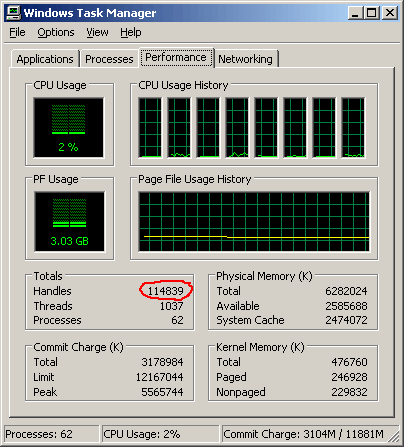 In Task Manager the number of total handles was very big and constantly growing without any user interaction or running applications. Looking to which process is using so many handles, i localized svchost.exe which is a windows core process and didn’t give much info. We couldn’t localize at this point which application is having such handle leak / memory leak , so the best solution was to uninstall latest installed applications which can have an impact over the hole system. So, I initially tested by removing AVG but didn’t help. Then i removed Outpost Security Suite Pro 9.1 and finally the handle leak stopped. Solutions was simple at this point, installing a lower version 8.x of Outpost Security Suite Pro which works perfectly.